The wintry conditions didn’t stop citizens from packing this week’s County Commission meeting and voicing their concerns about pending cuts to urban bus routes. 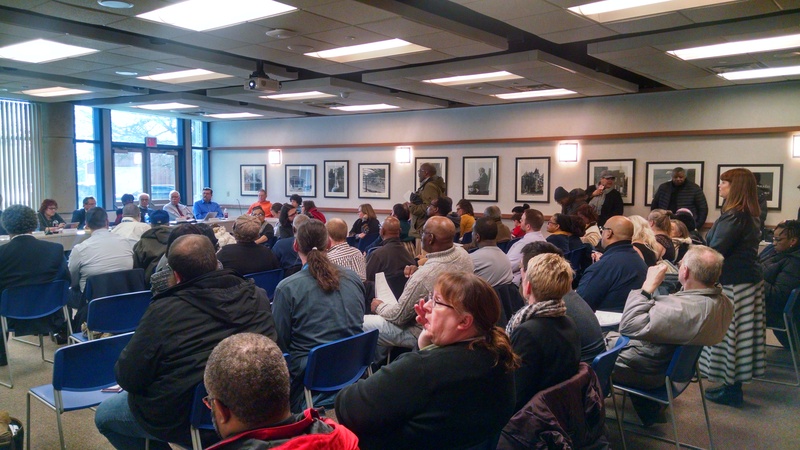 On Tuesday, more than 50 people crowded into the Louis A. McMurray Conference & Transportation Center in Muskegon Heights. In what county officials say is a cost-cutting measure, they want to cut two buses from routes on Apple Avenue, and also Peck and Sanford streets. Muskegon Area Transit System Manager James Koens said there’s a budget shortfall of $440,000 for 2019. He asked the Muskegon County Board of Commissioners to approve cutting buses from these two routes effective April 1. He said a route study will be performed within the next two months. “There’s no good feeling in making these cuts but to address these expenses, we have to bring something to you,” he told the commissioners. He added that a couple of personnel positions have already been eliminated, as well. At issue, says critics, is that these routes are needed, serving residents of inner city Muskegon and Muskegon Heights. Some members of the public came in walkers, while others had personal transportation but came in support of bus riders. And many expressed that making the cuts prior to the study is putting the cart before the horse. Muskegon City Commissioner Ken Johnson said it is “disconcerting” to lose any bus routes, but particularly that of Peck and Sanford because it’s a major corridor between the cities of Muskegon and Muskegon Heights. While Koens said these proposed routes have two buses running daily, and he is proposing to cut one bus per route. Cathy McIntyre told county officials that she’s been a bus rider off & on since 1983, using it for the grocery store and the laundromat. “We need both buses on those routes to stay running,” she said. Yolanda Narlock is a regular on the MATS system, and said navigating it will be even more of a challenge with the proposed route cuts. “As a rider and user of public transportation system, as it is I have to take 3 buses to get to work and home. It’s hard,” she said. Al Nichols, who is president of the Woodcliff Neighborhood Association in Muskegon Heights, said county officials should keep in mind that those who are most impacted by these cuts are those with high needs, who are also citizens and taxpayers. According to County officials, in the late 2000s, the economy was down and ridership was up, so more routes were added to accommodate the increased number of riders. County officials have not yet voted on the issue. The public may feel free to continue to follow this issue and also voice their concerns to county officials regarding the proposed cuts to Muskegon County bus routes. The next meeting of the Muskegon County Board of Commissioners is Tuesday, Feb. 26, 3:30 p.m., 4th Floor, Hall of Justice, 990 Terrace Street, Muskegon, MI 49442.